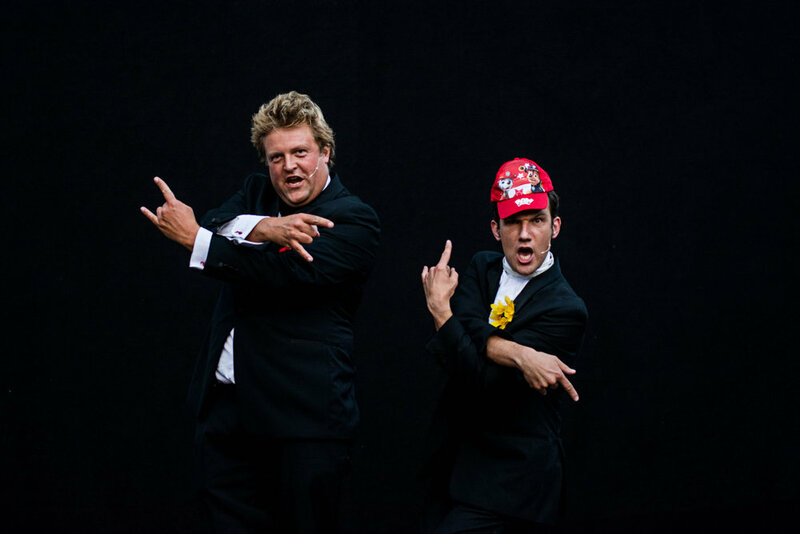 Multi-award winning street theatre and Cabaret from this classic yet unique double act. Richard Garaghty and Goronwy Thom are both seasoned veterans of show business. Together they create successful shows in almost any situation and amaze and amuse audiences with and without language. They have toured across the World with their international show, creating pop up shows at festivals from South Africa to Lebanon, from Switzerland to Canada and to many, many others. Having begun his performing career on the hallowed cobbles of Covent Garden aged just 18, he has honed his hugely likeable unique performance style to huge audiences in the most famous street theatre venue in the World. He has also performed at festivals and cabarets across the world including at The Cape Town Comedy Festival, Edinburgh Festival, Glastonbury, and many others. He has appeared regularly on TV and radio as an actor and has been seen in several Doctor Who episodes, as a Robot in CBBC favourite Mission 2110, as a belly dancing orang-utan on Egyptian Television, as a gorilla with Dom Joly in Dubai, with David Attenburgh as a Dinosaur, The lead in indie movie hit YONDERLAND and in the most recent Star Wars film with JJ Abrahams. He is also a founder member of Slightly Fat Features the comedy troupe bringing variety back to the 21st century. Touring Worldwide with the smash hit award winning show. Hailing from Sheffield where he started on the stage in Ibsen age 4 at The Crucible. He packed in serious theatre soon after and ran away to the circus school- to Circus Space in London, now called the posh National Centre for Circus. There he began compering cabarets across the country and started to perform street theatre at Covent Garden and across the UK including at Glastonbury, The Millennium Dome and The National Theatre. He also trained at the theatre school Bretton Hall during this time. He has since starred in and Hosted MAny shows across the world at many major theatre and comedy festivals. He has Headlined on the most famous ocean liners across the globe as a solo act- HE WAS ONE OF THE FINAL PERFORMERS TO PLAY THE FAMOUS QE2 STAGE. He has done street shows from Romania to Lebanon. in 2007 HE CREATED SLIGHTLY FAT FEATURES a comedy troupe who create variety shows for the 21st Century. The troupe have appeared at The Edinburgh Fringe, Leicester Square Theatre, The Roundhouse, Bristol Tobacco Factory and won awards at the Great Yorkshire Fringe and at Montreal Just for Laughs. They have also featured on Radio 4 and ITV.